It’s raining pancakes here at ‘domhearts‘ headquarters – not that I am complaining! So in the spirit of Pancake Day (also known as Shrove Tuesday), and the celebration of this tasty little treat, I wanted to share my favourite pancake recipe with you. Whether you are a novice in the kitchen or a seasoned chef, getting the best, fail-proof recipe is essential to ensuring your treat is not a flop when you flip your pancake in the pan. I have had my fair share of runny, rubbery, salty and greasy pancakes in my kitchen, but can now say thanks to some experimenting and the culinary genius that is Jamie Oliver, I have the best pancake recipe down and neatly tucked in my favourite ‘I won’t mess this up’ recipes folder. I’ve included what I feel is his best pancake recipe below. I enjoy cooking and experimenting with Mr Oliver’s recipe’s as they’re always easy to follow and use wholesome ingredients to add something special to a plate. I tend to vary the ingredients depending on what’s in season, but for the most part, the exciting thing about pancakes is that they’re like a blank canvas – so anything goes! Start by adding your egg, flour and baking powder to a large mixing bowl. Next add in your milk with a pinch of salt and mix together until smooth. Now, add your coconut to the batter, I usually use desiccated, but am sure you can use freshly grated coconut if you have it available to you. Once the coconut is mixed in, set the bowl aside to rest. While your batter is resting, start preparing your pomegranate by cutting it in half and de-seeding the fruit. This can be a little tricky, so I find it useful to turn the pomegranate half upside down and cradle the open end with my finger, then taking a spoon, knock the outer shell of the pomegranate until the seeds drop out. Once you’ve got enough seeds, give them a rinse. Now for the pancake! Put a frying pan on medium heat – you don’t want the pan to be sizzling hot or the outside of your pancake will cook too quickly and the inside will remain raw. Add about half of your butter to the pan and wait for it to completely melt and slightly bubble. Take a medium sized ladle and spoon your batter into the pan. Now let the pancakes cook for one to two minutes until you notice batter bubbles rising to the top from the heat. Take your spatula and delicately flip your pancake so it can cook evenly on the otherside, again do this for one to two minutes until delightfully golden brown. 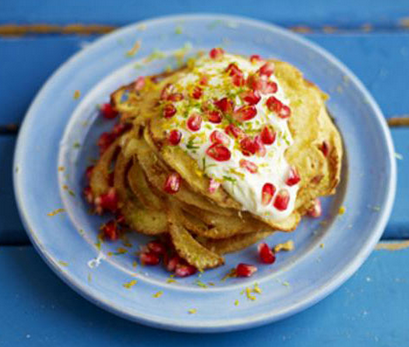 For the topping, add a spoonful of yoghurt or ice-cream, I like using a subtle vanilla flavour, and then finish off with a sprinkling of pomegranate seeds – and for some extra zing, the zest of a lime.